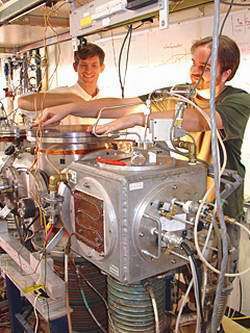 Image: Alex Cronin (left) and John Perreault make an adjustment on the atom interferometer that they used in making the first direct measurement of atom wavelength shift caused by the van der Waals interaction. Perreault and Cronin used a sophisticated device called an atom interferometer in making the measurement. Cronin brought the 12-foot-long device to UA from MIT three years ago. The atom interferometer was assembled over 15 years with more than $2 million in research grants from the National Science Foundation, the UA and the Research Corp. Now in Cronin's laboratory on the third floor of the UA's Physics and Atmospheric Sciences Building, the machine is one of only a half-dozen such instruments operating in the United States and Europe. It splits and recombines atom waves so that scientists can observe the position of the wave crests. "Our research provides the first direct experimental evidence that a surface 25 nanometers away (25 billionths of a meter) causes a shift in the atom wave crests," Perreault said. "It shows that the van der Waals interaction may be a small scale force, but it's a big deal for atoms." Perreault and Cronin found that atoms closer than 25 nanometers to a surface are very strongly attracted to the surface because of the van der Waals interaction-- so strongly that the atoms are accelerated with the force of a million g's. A "g" is a term for acceleration due to gravity. One g is an everyday experience -- it's the force a person feels from Earth's gravity. A roller coaster rider might feel 3 to 4 g's for brief moments during a ride. Fighter pilots can experience accelerations of up to 8 g for brief periods during tactical maneuvers, but can black out if subjected to 4 to 6 g's for more than a few seconds. "We might say that when an atom is between 10 and 20 nanometers from a surface, it gets sucked toward the surface with a force a million times its weight," Cronin said. "And when it gets closer, it gets pulled even harder." This simple sketch shows the placement of diffraction gratings - represented by the vertical dashed lines - that split and recombine atom waves. The gratings are about a meter apart. 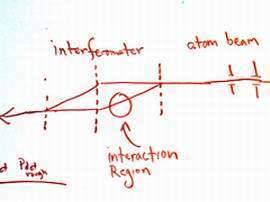 The momentary acceleration of the atom as it passes by the surface is expressed in a famous equation which relates the speed of an atom to its wavelength, Cronin said. When atoms are accelerated and closer to the surface, their wavelengths become shorter. When farther from a surface, atoms return to their original wavelength. Perreault and Cronin used the atom interferometer to measure the wavelength shift. Nanotechnology research aims to build much smaller transistors and motors, for example, than currently exist. Atom optics research aims to exploit the wave behavior of atoms in ways that will make more precise gyroscopes for navigation, gravity gradiometers for subterranean mapping and other field sensors. "I think the impact of our work stems from the intersection of the fields of atom optics and nanotechnology," Perreault said. "It answers the question of how far you can miniaturize an atom optics device - for example, a device that guides atoms on a chip to form a very tiny interferometer - before this nano-interaction disrupts operations." The idea that atoms behave as waves as well as particles goes back to 1924. They're called "de Broglie waves" for early 20th-century French quantum physicist Prince Louis-Victor de Brogli, who first proposed the concept of atom waves. Scientists have grappled with the dual wave-particle nature of atoms for decades and, in the 1990s, they began chilling atoms to near absolute zero and studying the wave properties of atoms in detail.